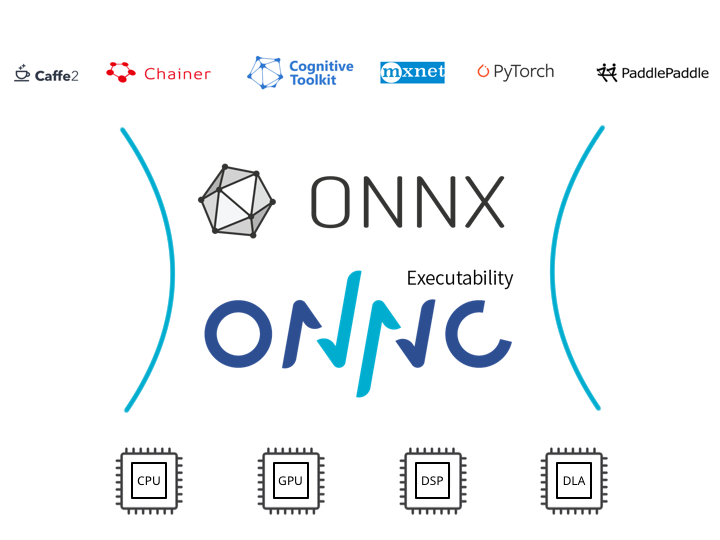 ONNC (Open Neural Network Compiler) is a collection of open source, modular, and reusable compiler algorithms/toolchains targeted on deep learning accelerators (DLAs). Based on ONNX format, ONNC transforms ONNX models into binary machine code for DLA ASICs. ONNC leverages the IR design of ONNX and provides effective algorithms to alleviate the overhead of data movement. ONNC increases the DLA performance and shortens the production time for DLA ASICs. ONNC is integrated with the LLVM bitcode runtime and compiler. If a DLA already supports the LLVM compiler, it can be connected to ONNC seamlessly. This helps most CPUs, GPUs, and DSPs ported to ONNC in a very short time. On the other hand, if a DLA has unique computation features and is not compatible to LLVM, ONNC also provides a modular framework to speed up the compiler development. DLA vendors can quickly customize an ONNC backend from a so called “vanilla” backend, which already provides some necessary optimization algorithms. Two of ONNC’s contributions are dividing the AI compilation into several clear phases and giving the corresponding APIs for algorithm development. There are five phases carefully defined, each of which is focused on a particular compiler problem: IR building, partitioning, scheduling, allocation, and code emitting. ONNC also provides a series of optimization algorithms ready for use. They are general and reusable, including tensor selection, tensor liveness analysis, linear scan local memory allocation, etc. 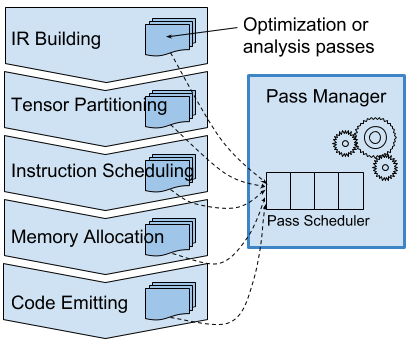 ONNC’s pass manager is flexible and similar to LLVM’s. AI researchers and engineers who are familiar with LLVM can intuitively contribute their general or target-specific optimization algorithms to ONNC. Get everything you need on our GitHub page. There are three different types of developers in the community: porters, compiler engineers and testers. We provide three different sub-projects for these developers. In the ONNC project, there are three sub-projects: umbrella, onnc and regression. The umbrella project offers a simple way for users and porters to build and install ONNC applications. It collects dependent 3rd party libraries and provides scripts to build them. Porters can easily understand how does ONNC connect to the outside world and ONNC’s assumption of the surroundings. It helps porters to figure out the best approach to deploy on their system in a short time. The umbrella project also provides a minimal environment for users. Users can easily boot up ONNC in their system from the Umbrella project. 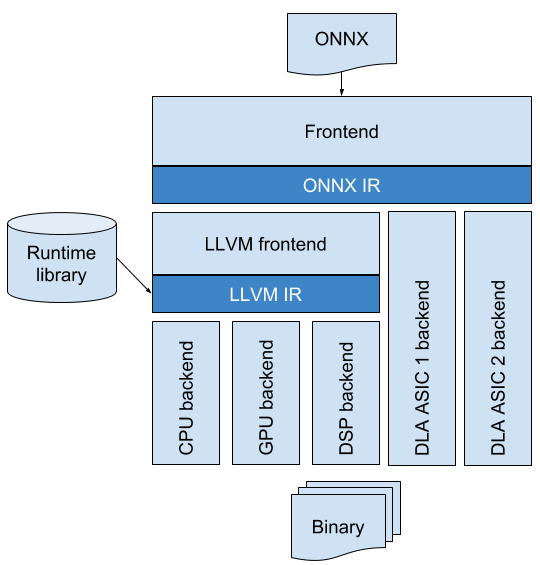 The ONNC project provides a modern compiler framework for ONNX format. We define a two-level intermediate representations (IR) for both target-independent and target-dependent compiler analysis and optimization. It also provides an iterative pass manager to help target-dependent optimization algorithms figure out the best parameters via try-and-error. Our modular target device selector helps DLA vendors to port ONNC on their devices in a simple way. The Regresson Test project is a placeholder of full regression tests. It may spends days to run regression test once. Before a major release, all tests in the full regression should be passed. ONNC is coming soon at the end of July. If you want to learn more about the ONNC, here are some articles that you might be interested in. ONNC is an often release project, any ideas for developing ONNC are welcome. Join our mailing list or Gitter and share your ideas with us. Contribute directly on our Github. Get the latest updates from us. Copyright © 2018, Skymizer Taiwan Inc. All Right Reserved.